I am working on building some stock for a couple of craft fairs next month and wanted to work on Valentines cards. But I have a wee problem..... I do not have many Valentines stamps. Pinterest for ideas? Yes that sounds wonderful! 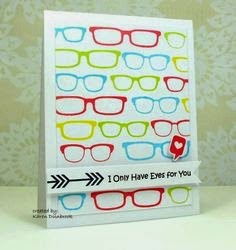 I found this cute little "Glasses card" and thought hummmmm what do I have that will work with this idea? I have glasses as stamp but did not have a cute little sentiment BUT I also have a fun pun stamp set that had these cute lamp stamps that were screaming to be used. Sometimes just a spark can get the creative juices going and the end result is better than you thought you could do. Dig out your stamps and cardstock - play and see what comes out of your head.